Dear editor of Mashriq, Gorakhpur. Peace be unto you. As an eye witness, I deem it necessary to narrate to the Muslims, [the passion of] two venerable Ahmadis of Qadian, District Gurdaspur who are serving the faith of Islam with utmost sincerity and zeal in England. Last winter, when Hazrat Mufti Muhammad Sadiq Sahib was touring the suburbs of England and Qazi Abdullah Sahib was working alone in London, I incidentally would have the chance to visit their residence, mostly on Fridays, but on other days also. I felt overjoyed to observe a community of respectable ladies and gentlemen gather, among whom some had accepted Islam at the hands of these venerable persons while some were still researching the faith. Qazi Sahib delivers the sermon very eloquently in the English language and congregational prayers take place. I also travelled to London when Hazrat Mufti Sahibra returned to London. Only yesterday, our honourable friend Mr Ahmad Din, who is a merchant, and I arrived at Star Street, London in the evening. As a Muslim, when you enter this street, you feel great joy observing the word “Al-Masjid” written in bold Arabic letters in the middle of a market, the declaration of faith and the blessed verse, “Innaddina ‘indallahil-Islam” in the corner of a heart-warming atmosphere, in a central location of a city such as London. 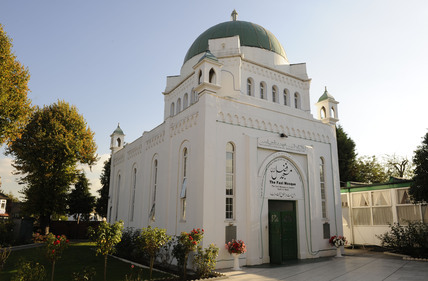 In the whole of London, which extends many miles and wherein thousands of Muslims reside, this is the sole residence upon which these words can be seen. Further, it is only the dweller of this household, i.e. Hazrat Mufti Sahib, who travels throughout London performing tabligh without any hesitation in his Islamic turban and attire. Thus, we arrived there in the evening. There were other people gathered as well. It had grown into a considerable gathering of respectable people. At 6 o’clock, Hazrat Mufti Sahib’s lecture commenced regarding those prophecies which [Hazrat] Mirza Sahib had delivered in his age in support of Islam. Their fulfilment in the European continent is a powerful argument for Europeans in relation to the truthfulness of Islam. Proving [Hazrat] Mirza Sahib’s claims of being the Messiah and Mahdi with remarkable eloquence and robust and logical arguments, Mufti Sahib claimed with great confidence that this is the one true religion which [Hazrat] Mirza Sahib presented to the world in this age, with a divinely revealed revival, something no one can contest. Further, he mentioned the command which [Hazrat] Mirza Sahib had issued in support and in relation to obedience and loyalty to the British Government. When the lecture had concluded, an elderly man, Mr McDonald, a renowned scholar who has served as the editor of an English newspaper, stood up and raised a philosophical question regarding prophecies, that scientists can also make prophecies. However, Mufti Sahib and Qazi Sahib convinced him [otherwise] afterwards by demonstrating a plain and manifest distinction between the prophecies of scientists and prophets with great logic and reason, for which all the listeners were grateful. It is my hope and expectation that this mission will progress rapidly in this country and become a large tree. Hazrat Mufti Sahib possesses such a vast degree of knowledge regarding Christianity that no priest can stand before him. On many occasions, people observe the reality of this.